You will be charged £1 per minute plus your phone company's access charge. Select the reader you want from this list and the call will be put through to them. Please note that you will only hear the intros of readers who are online. As per PhonepayPlus regulations, the maximum duration for a single call is 30 minutes. 30 minutes for £27 (only 90ppm). To pay by card, call one of our access numbers - Freefone 0800 075 6006. You can then follow the menu options to create your customer account by speaking with one of our customer service team. Get 20 minutes of readings for just £8.99. 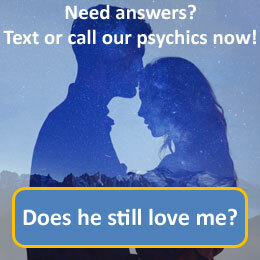 That's a professional and trusted live 121 psychic reading for only 45 pence per minute. Call 0800 075 6006 to get this offer now. Text the word DESTINY followed by your question to 67111. You will only receive text messages to the questions you ask. Messages cost £1.50 per message received and you will be charged your normal standard network rate for messages sent from your phone.